The list of 13 selected for the international prize has just been published, it includes well-known writers such as John Le Carré or Philip Roth, but also for the first time two Chinese writers: Wang Anyi and Su Tong (winner of last year Man Asia prize for a good novel to be reviewed soon, “The Boat to Redemption “). and short novels, rarely mentioned, some of which have just been translated into English. She makes her point in two short stories, published in 2008 by FLP in Beijing, in a set of three books containing in over 1200 pages a number of short stories by contemporary writers. The “Confessions in a hairdressing salon” (2) have won the Lu Xun prize: life in a small salon with the boss, two employees and a client who gives a hand and tells her story. As in all the short stories by Wang Anyi, one can not expect surprises in unexpected endings, in extra-ordinary heroes, but a very pleasant little music. “A young girl in a boudoir” (3) is a very different text that reminds us of the masterpiece of Wang Anyi “The Song of everlasting sorrow” (4). This girl, educated during the Cultural Revolution, lives with her mother, works as an accountant in a kindergarten. Time has no impact on her, several interested young men are rejected, crocheting, sewing, clothing, television, and its operas, the church for her mother, some friends, some colleagues, the outside world does not reach them. Social conventions and prejudices prevail over everything else. An interesting portrait and a wink from the author: a journey of the two women in northern Hunan, in the beautiful area of Zhangjiajie then in Hibiscus village where was filmed the movie full of sound and fury from the book by Gu Hua (5). In Hibiscus, she is chosen from the audience to play a bride! Most of these texts are about the Cultural Revolution, but politics and struggles of that era are not there. The Cultural Revolution had little impact on the lives of the ordinary people who are the heroes of these short stories except for the crippled Ah Qiao trying to find a position in society. Everything is written in a very neutral tone, neither ideology nor criticism! She speaks of the youth “sent to the countryside,” as Wang Anyi was in “The Wedding Banquet” where we see these marginalized youth in a peasant society. 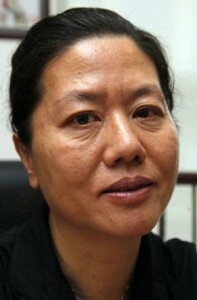 She also describes the migrants who come from their villages to be exploited on building sites in Shanghai. It is clear that their cousin “The tall student” who claims to defend them only aggravates the situation. These stories have a fairly simple plot and are rather static without unexpected or spectacular ends. There are not many developments. Wang Anyi knows how to create an atmosphere, sometimes poetic (as in Fang Ah, the fruit seller). Sometimes, the accumulation of details of everyday life, clothing, cooking, may be dull. But we are taken by the portrait of some characters (Ah Qiao, the student …). We are surprised by the absence of modern Shanghai and of the new generation; has she trouble understanding these developments as most writers of her generation, or perhaps it will be the topic of a forthcoming collection of short stories ! (1) Interview by Lena Scheen; ILAS Newsletter Winter 2010. (2) “The great masque and more stories by Women Writers” – FLP 2008, 450 pages. 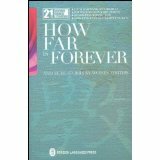 (3) “How Far Is Forever and more stories of life in the city” – FLP 2008, 450 pages. (4) “The song of everlasting sorrow”, translated by Michael Berry and Susan Chan Egan; Columbia University Press, 2009; 450 pages..
(5) “Hibiscus” by Gu Hua, translated by Philip Grangereau. Robert Laffont 1987. 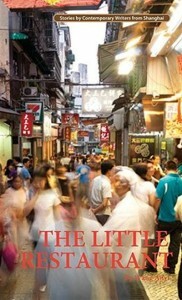 (6) “Little restaurant” translation Yawtsong Lee. Better Link Press, New York 2010, 360 pages. (7) Having questioned the editor, I was answered by return; these short stories are from collections or literary journals mostly from 1998 to 1999.